Emergency practitioners and other clinicians working in acute care settings frequently encounter patients who have trauma to or pathology of the dorsum of the foot and require anesthesia for treatment and repair. Regional block of the superficial peroneal nerve allows for rapid anesthetization of the dorsum of the foot, which allows for management of lacerations, fractures, nail bed injuries, or other pathology involving the dorsum of the foot. Regional blocks have several advantages compared to local infiltration, such as fewer injections required to attain adequate anesthesia, smaller volume of anesthetic required, and less distortion of the wound site. 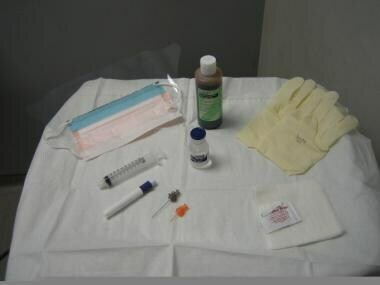 Because of the lower number of injections, this procedure is better tolerated by the patient and limits the chance of a needle stick injury to the provider. 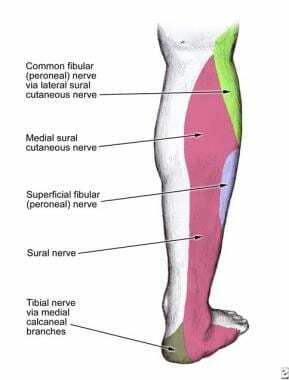 Understanding the anatomical distribution of the superficial peroneal nerve is helpful in performing a successful blockade of this nerve. 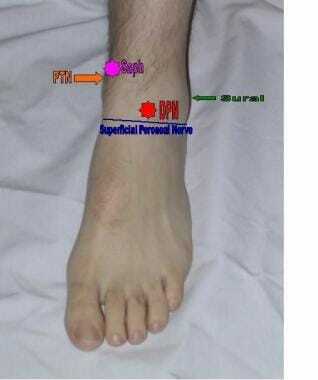 The superficial peroneal nerve arises from the common peroneal nerve, which also gives rise to the deep peroneal nerve. 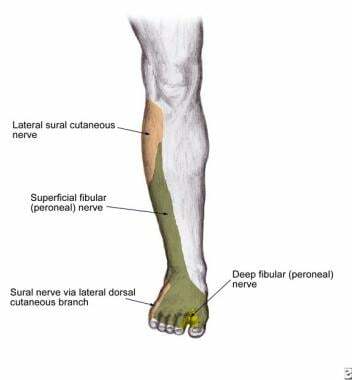 The superficial peroneal nerve originates between the peroneus longus muscle and the fibula. It courses down the lateral compartment of the lower leg along with the peroneus longus muscle and the peroneus brevis muscle. It then descends posterolaterally to the anterior crural intermuscular septum. It runs anterolateral to the fibula between the peroneal muscles and the extensor digitorum longus, eventually supplying the peroneal muscles. In the distal third of the leg, it pierces the deep fascia to become superficial. The nerve splits into the medial dorsal cutaneous nerve and the intermediate dorsal cutaneous nerve, which give rise to the dorsal digital nerves. These nerves supply the skin of the anterolateral distal third of the leg, most of the dorsal foot, and the digits. However, this nerve does not supply the web space between the first and second digits or the lateral fifth digit. At the level of ankle, the superficial peroneal nerve splits to fan out between the medial and lateral malleoli. Dermatome of the superficial peroneal nerve at the level of posterior calf. Superficial peroneal nerve dermatome at the level of the anterior lower leg. As part of an ankle block required to manipulate a fracture or dislocated ankle (A combination of posterior tibial, saphenous, superficial peroneal, deep peroneal, and sural nerve blocks results in complete block of sensory perception beneath the ankle. Compared with more proximal approaches to the ankle block, motor block is rarely a concern with the ankle block. See the image below. Position the patient supine, with the ankle supported by a pillow or rolled sheet, optimizing comfort. Alternatively, the patient may sit and face the physician while maintaining a similar leg elevation. Expose the area of injection and identify the medial and lateral malleoli by palpation. Draw a line from the distal anterior aspect of the lateral malleolus to the anterior border of the medial malleolus. See the image below. Line of anesthesia from lateral malleolus to medial malleolus. Wipe the area with an alcohol pad and clean the site thoroughly with antiseptic solution, moving outward in a circular fashion. Maintaining sterile technique, place an initial skin wheal of lidocaine anterior to the distal lateral malleolus using a 25-ga needle. Insert the 25-ga needle through the skin wheal and infiltrate 6-10 mL in a transverse fashion until the medial malleolus is reached. See the image below. Anesthetize along the line from lateral to medial malleolus. Adding a buffering solution, like sodium bicarbonate, can significantly decrease the pain of the injection when performing a nerve block. [11, 12] Add 1 mL of sodium bicarbonate (44 mEq/50 mL) to 9 mL of lidocaine. Hemorrhage: Reports of significant hemorrhage during regional anesthesia are rare, even in patients who have blood coagulopathies. A hematoma may develop with intravascular puncture. If prolonged bleeding occurs, attempt to obtain hemostasis with direct pressure and elevation. Exceeding total dose of anesthesia: The dose of 1% lidocaine without epinephrine should not exceed 5 mg/kg. If lidocaine with epinephrine is used, total dose should not exceed 7 mg/kg. Systemic toxicity manifests in the central nervous and cardiovascular systems. [7, 16] Signs such as tremors, convulsions, tachycardia, or respiratory compromise should alert the physician to stop the procedure and reassess the patient. A disadvantage of the ankle block is that it usually requires large volumes of local anesthetic. According to Frederickson, these volumes can be reduced with the use of ultrasonographic guidance because of the more precise needle placement and real-time repositioning that such guidance allows. This reference concludes that typical volumes of 30 mL can be reduced to 15 mL for the entire ankle block. Davies T, Karanovic S, Shergill B. Essential regional nerve blocks for the dermatologist: Part 2. Clin Exp Dermatol. 2014 Dec. 39 (8):861-7. [Medline]. Gmyrek R. Local anesthesia and regional nerve block anesthesia. Medscape Reference. January 29, 2007. [Full Text]. Kelly JJ, Spektor M. Nerve blocks of the thorax and extremities. Roberts JR, Hedges JR, eds. Clinical Procedures in Emergency Medicine. 4th ed. Philadelphia, Pa: WB Saunders; 2004. 584-9. Moore K. The lower limb. Clinically Oriented Anatomy. 3rd ed. Baltimore, Md: Williams and Wilkins; 1992. 446-9. Netter FH. Lower limb. Atlas of Human Anatomy. 2nd ed. Teterboro, NJ: ICON Learning Systems; 1997. 506. Paris PM, Yearly DM. Pain management. Marx JA, ed. Rosen’s Emergency Medicine Concepts and Clinical Practice. 5th ed. St. Louis, Mo: Mosby; 2002. 2571-3. Richardson, EG. Surgical techniques. Canale ST, ed. Campbell’s Operative Orthopaedics. 10th ed. St. Louis, Mo: Mosby; 2003. 3911-4.